Well, in my "sophomore spice" group of friends from college, we have a "Flat" version of whichever one of us could not be on a trip. 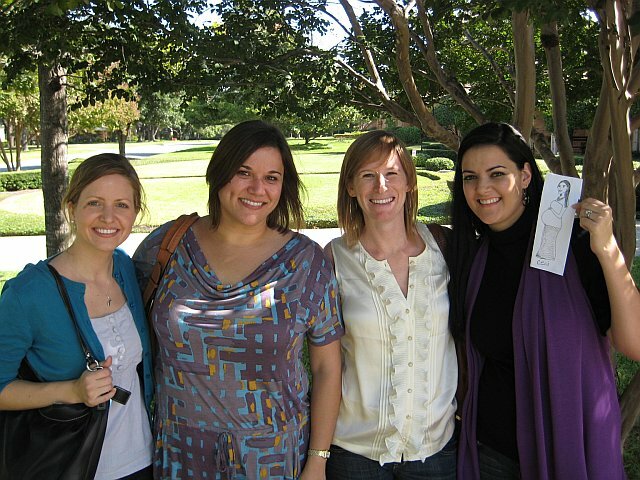 My friend Claudia (far right) for instance could not be at my wedding or our trip to Arizona 2 years ago and Chicago last year...so we made a "Flat Claudia" and took pictures with her. Last weekend was my 10 year college reunion at SMU. I was really sad I could not go and be among friends on the Hilltop---but I am in the no fly zone, and frankly Baby C is more important at this point. SO...the girls made a "Flat C"...notice how prego I look...well because I am. These are my friends L-R, Julie "Cool", Sara, Mary Michael "MM" (who is 20 wks prego), Claudia "Clouds" and me...our friend Lindsay is missing from this picture too, but she was there...hence no "Flat Linds". What fun traditions do you have with friends? 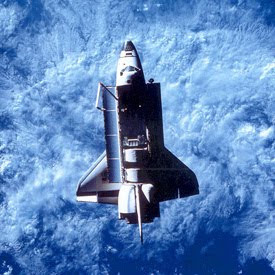 On November 1, the space shuttle will be heading into orbit for its final mission. NASA has a contest going, where the public can vote for what song they play to wake up the astronauts on their last morning in space. "Good Day Sunshine" by The Beatles is WAY down in votes... but most of the songs are really good options. Once you cast your vote, you can see how the votes are stacking up. Yes, I've been busy...but as I mentioned a bit ago there are some things I need to finish up before Ms. C arrives. In May, one of my nearest and dearest friends had the sweetest little boy named, Miles. This weekend I got the canvas out and started on it. Over on the left you will see the color sketch of his painting, and the work that has started on his canvas. I'm going to put paint to canvas this week and have it ready for her this weekend. I'll show you progress as I make it. Pinky Show - We Love Museums...Do Museums Love Us Back? I'm in love...with this very funny look into the world of museums. I was introduced to this video today at work--and I think I've watched it a few times since I got home from work. If you're not a museum person--- you'll enjoy the cats at least. The Nina, the Pinta and the Santa Maria...naturally! It was a hit and most impressive. 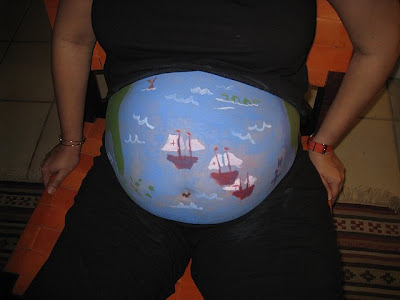 I created this work of belly art by sitting in a chair infront of our full length mirror and a set of facepaints. 25 minutes later... this was the end result. These are my new treasured pens for drawing and water coloring. 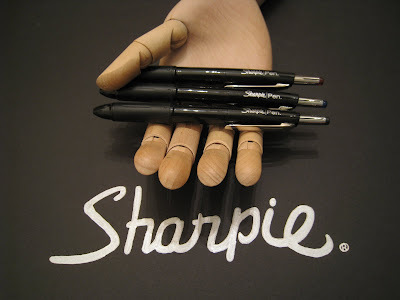 They are fantastic because they give me that fine line I look for, but they also are waterproof...so they won't bleed. They come in 3 varieties...the retractable (shown above) and in 2 pen styles. I have a few of each style in both blue and black. I highly recommend these beauties! I know that I've been slow about sharing the new house--- only having shown you the living room--and a sliver of the nursery. Here is the latest look at the living room-- we've made some changes. You will also see the dinning room and our foyer. I'm loving how our home is coming together! Today is our 4 year wedding anniversary---and the only thing I asked for was for the crib to be put together--so that room will be unveiled soon. Today the ladies from the museum's curatorial and some from education department took a field trip to Boyton Beach to visit the Museum of Lifestyle and Fashion History. They just opened an exhibit called, For the Love of Lilly. An historic look into the iconic line of clothes, and those who helped along the way. Here is a look into some of the treasures that came into the museum on loan from all over, including my friend Sheffield who owns, Back in Style, a savvy online vintage clothes store. And finally here I am...I had to take a seat. Baby C was kickin' up a storm and mama needed to take a break. If you are in Florida and in the area of Boyton, go take a look. They also have a fun exhibit on Barbie over the years. Lilly will be up through the spring at the Museum of Lifestyle and Fashion History. Our house is coming together. I know I had already shared pictures of the living room...but there have been some changes. Pillows on couch have been reupholstered. They match the reupholstered chairs, piano bench and newly sized ottoman. My aunt gave us a lovely gift, the painting over the couch was from her collection. You either love it or you hate it, we really love it. Finally the first glimpse into the nursery. Our glider came in, we found the perfect bookshelf/sidetable...the red dresser/ changer is in place, and the rug is on the floor...crib is coming this weekend, so I'll show other corners of the nursery soon. I can't wait to show the whole house...it's almost done!! That's what I call this sketch. I was waiting for the doctor yesterday when I got in a drawing mood and did this. So all of these thoughts inspired this drawing. I did a nice recap of the week and progress on the house over on Florida Room. But...here's a peak at what I am looking like. Some say I've started to "drop"...we'll see what the doctor says tomorrow. 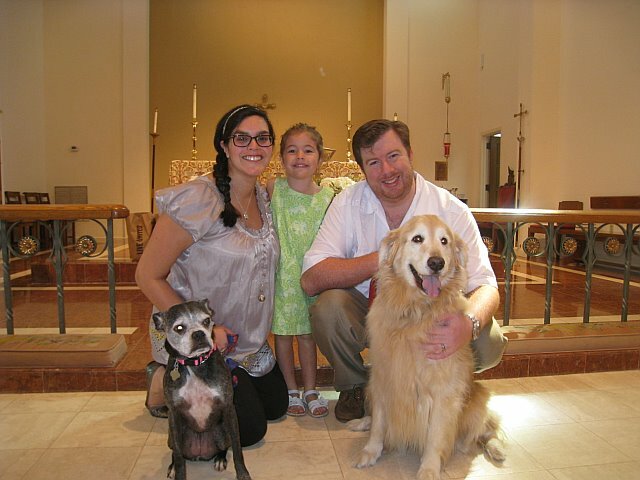 She's the little black dog in this picture taken last Sunday at the blessing of the animals. Joining Miss Marley is her little sister Olivia, her Uncle Don, Aunt Ceci and cousin Maggie Anne. My sister-in-law, Kathleen adopted Marley as a puppy in Gainesville, FL when she was at the University of Florida getting her masters while Don (a.k.a. Mr. cSd) was an undergrad. The two of them lived together in an off campus apartment and Marley was "theirs" (she was really Kathleen's). Fast forward 14 years, Marley moved to Ft. Pierce with her mom, saw her mom meet a boy, fall in love and get married...she moved to Tallahassee with the newlyweds and finally made her way home to Miami with the couple who then went on to have two little girls. Marley could jump higher and run faster than any dog I'd seen. She was well behaved and listened to you, and most of all, she just loved her family. Yesterday, Marley wasn't feeling too well...and sadly before we knew it, she was gone. Marley apparently had leukemia and a tumor in her heart. We're all very sad...but glad that we had Marley in our lives. I know I enjoyed my 9 years with her, and most of all loved to see her playing with her cousin and BFF my Maggie. The best Marley story hails from a year ago--- Kathleen was prego with Julia and coming home from a party on a Thursday night with Lamar (her husband). They mistakenly locked Marley outside when they got home...the next morning Marley was nowhere to be found. They made fliers, Don rode his bike around the neighborhood stopping at every corner calling our Marley's name at the top of his lungs (mind you Marley was starting to go deaf). A big search party gathered that evening to look for Marley...and nothing. That night---we all prayed for Marley's safety. The next morning, Don woke up and let Maggie out, much to his surprise, he was greeted at our front door by Marley! She had walked about a mile and across 2 major streets to find her way to our house! Don describes the look on her face as that of relief. She let herself in and went right to the kitchen for food and water. Marley no doubt had caught onto Maggie's scent and when she got to our house recognized everything, including the balls the two of them had been playing with about a week before when she stayed with us for a few days. Marley was one of a kind, and now she's catching balls and flying for frisbees in heaven. RIP Marley...we loved you and we always will. "It could happen anytime between the next 2-4 weeks"
That's what my Russian OB/GYN said to me yesterday. I go to a great group of 5 OBs and since I go as often as I do (went from bi-weekly to weekly now), I get to see all of them. But, I digress... when Dr. Russia said this to me I told him, "No, we have an understanding--she is going to come on time in 5 weeks"... why is there an understanding? 1. I have 2 paintings to start and finish for friends. 2. I have to redo 2 pages out of the book I have been working on. So...with 5 weeks to go, I LOVE this poster and saying more than every...I shall just keep calm and carry on. There are a few great children's stores in town that I am considering going to and seeing if they would be interested in picking up some of my paintings as merchandise. One of the stores is called Kreativa for Kids . It's such a great store! We actually got our glider/recliner/ piece of heaven there. 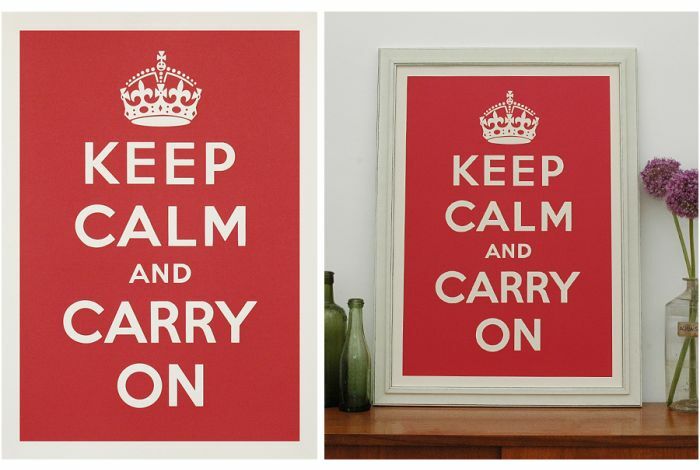 The store has a gorgeous selection of furniture and decor for kids and teens rooms. So...over the next few weeks I am going to see how I can find good homes for paintings like "Cherry Pie". Yesterday I went fabric shopping with my mom. We were looking for the right accent fabric to go with what we reupholstered two chairs in our living room with. We found this yellow one to accent the brown elephant, gator, monkey fabric. c We also found a great koi fabric for the seat cushions in our breakfast nook...and I found another pretty one---that I just admired in combination with the koi. I love going to Calico Corners. In other news, visit the Florida Room to see the latest and greatest baby bump growth. When I am not at work, or painting...or these days growing a baby... I'm volunteering. There are a few organizations I give my time to, and one of the is the Junior Orange Bowl Committee (JOBC). The JOBC is the largest Youth Festival in the world, hosting internationally acclaimed golf and tennis tournaments, a 62 year long tradition of a Parade, scholarships for young athletes, and other sports competitions such as, gymnastics, basketball, hockey, cross country and competitions in the arts such as art, photography and writing. All of the money for these events comes from grants, private support and the annual JOBC Auction. For the past 3 years I have been chairing the event. This is my last year, as I know I will not be able to devote the time to it that it deserves next year. When I found out this year I was pregnant I quickly turned to my friend, and event talent, Robin who has been Co-Chairing with me. The auction is TONIGHT, at the Miami Rowing Club...and not only is it a good time, it boasts an open Bacardi Bar, food by catering sensation, Relish, music by DJ Zelda, over 60 silent auction items, 6 great raffle items which include an autographed Marlins Baseball, and 6 unique live auction items which include a ride on the Goodyear Blimp! The best part, is that the ticket price is dirt cheap in my opinion... $40 (if you reserve before 4pm today) and $50 at the door! If that is not the best price for a Friday night event in Miami, I don't know what is. 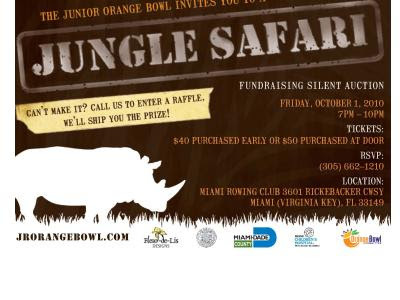 So...if you are in Miami and want to support a good cause, come on over to the Miami Rowing Club on Virginia Key. I'll even let you rub the Buddha belly!